August is a difficult month, particularly when you spend most of it on holiday! Since the last newsletter the building work at the children's home at our school in Moi's bridge, Kenya, has been completed. the appointment of house parents is in progress and the home will be formally opened at the end of September. !4 orphaned and vulnerable girls have a new and secure home. to complete the security of the home and site we need to install electricity. Funds are not available so any help raising the £2000 needed would be very welcome. 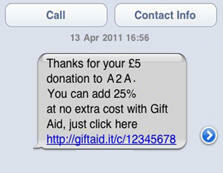 You can now donate to Aid2Africa by text from your mobile phone. It's quick and easy! amounts of £1, £2, £3, £4, £5 or £10can be donated this way - try it!